Can there be such a thing as spiritual science today? Should faith and spirit remain as purely private concerns – or, as traditionally, preserves of the Church? When Rudolf Steiner founded anthroposophy in the early twentieth century, his intention was to create a fundamentally scientific approach to the spirit. His basic works detail methods for developing spiritual consciousness, allowing the individual to replicate the results of his research. This key aspect distinguishes anthroposophy from the wealth of spiritual teachings, sects, cults and religions within the modern cultural milieu. But did Steiner fail in his endeavour to build a scientific path to spiritual knowledge? Is anthroposophy just another ‘theory’ based on intellectual thought, to be analysed and dismissed? Up to now, academia has largely ignored Rudolf Steiner’s work. In 2013, however, the first volume of a new series – a critical edition of Rudolf Steiner’s writings, edited by a professor of the largest religious university in the USA – was published by a respected German academic press. 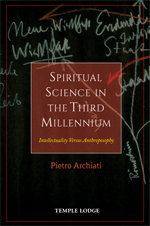 Taking this concrete case as an illustration, Pietro Archiati argues that academia, with its in-built bias towards the atheistic assumptions of materialistic science, will almost inevitably misrepresent Steiner’s work. Anthroposophy is a spiritual science, whose metamorphosing nature requires penetration of its essence for true understanding. Presenting a broad exploration of the critical questions outlined above, Archiati’s exposition works not only as a critique of a specific new edition of Steiner’s works, but also as an introduction to key tenets of anthroposophical methodology and thought. PIETRO ARCHIATI worked as a missionary in Laos (during the Vietnam war), New York and South Africa. When he discovered Anthroposophy in 1977, it soon became the passion of his life. Pietro is a popular speaker, working internationally, and has written several books, including From Christianity to Christ, Reincarnation in Modern Life and The Great Religions. With his colleague Monika Grimm, he also publishes key texts by Rudolf Steiner in the original German.